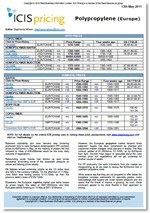 The ICIS Polyols reports are published weekly in Asia, the Middle East, Europe and the US. This independent and unbiased pricing information covers a variety of grades including slabstock, high resilience, conventional and foam depending on the region. Our locally-based network of reporters provide details of the factors affecting price movements. Commentary includes overviews, economic news, graphs, feedstock updates, demand and supply issues. This market intelligence will give you the confidence to make informed business decisions. Supply may tighten if polyols imports from the Middle East fall due to upcoming turnarounds at upstream propylene oxide (PO) plants there. Within China, polyols output may slow as plants in the country, and the wider region, are expected to shut or scale back on operations during the extended Lunar New Year holidays in February. Demand is expected to remain weighed down by lingering concerns about the ongoing US-China trade war and whether it will take a turn for the worse in 2019, further squeezing Chinese exports of foam-based product to the US. Polyols is a key ingredient in the manufacture of polyurethane (PU) foam. The intensity of demand in the first quarter will be key to Europe polyols supply levels. Availability was lengthy in much of the fourth quarter amid limited consumption. Participants will consequently be keeping an eye on order book volumes to understand how much product there will be in the market. Europe polyols market participants were unclear as to when purchasing interest would rise after a dampened 2018. Toluene di-isocyanate (TDI) fundamentals remain important in understanding where polyols order book volumes will be as both products produce polyurethane (PU) foam together. Polyol supply is anticipated to remain long in the first quarter. Inventories for propylene feedstock have been lengthening, suggesting that feedstock supplies for polyol producers will remain ample. The US polyol market is structurally long. Demand for polyols and polyurethane systems will be dragged down by seasonal factors in the first quarter, although underlying fundamentals remain healthy. Automotive sales are expected to continue to slowly ease after reaching historic highs earlier in the decade while the seasonal slow period in the construction sector will also depress polyol demand. Supply is not expected to see any major change in Q1 with no expected disruptions or plant maintenance shutdowns due in the quarter. The price of PO remains a concern for producers especially those based in China but there have been some signs of easing and as such some producer may have more flexibility to offer discounts going forward to entice buyers. Demand for all grades of polyols in the Middle East is expected to remain thin and deals would likely to remain elusive. Most buyers are expected to continue buying on needs basis while high prices of feedstock propylene oxide prevented many producers from offering bigger discounts due to high operating costs. We offer the following regional Polyols analysis and news coverage to keep you informed of factors and developments affecting prices in the Polyols marketplace. Breaking news of latest developments affecting the markets. Insight and analysis of factors driving prices. Information is accessed online, via the ICIS dashboard service and is configurable to suit your preferences. Produced by the ICIS Consulting team, these reports give a robust rolling 12-month price forecast, trade balances and in-depth analysis into where markets are heading – providing a valuable tool to support your short- to medium-term plans. ICIS pricing intelligence is delivered to you online via the ICIS dashboard. Here you can view your reports and also access other useful services including related news, analysis, historical data and market alerts. 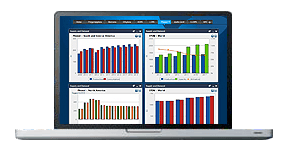 ICIS dashboard also makes it easy for you to create pricing charts, download price history and export data to create tailored analytical models. ICIS weekly margin reports deliver the detail you need to understand how production costs and prices are affecting margins, enabling you to judge the likely impact on your business and optimise your upstream and downstream business decisions. The Supply and Demand Window on the ICIS Dashboard provides a snapshot view of historical and forecast information for supply and demand, production capacity and trade flows – a key tool to help safeguard future investments within the chemicals market. 24-hour global coverage of breaking news in the petrochemical industry, including updates on production, shutdowns and key transacted deals, keeping you informed of market developments as they happen. The ICIS news service allows you to customise the market alerts delivered to your email inbox, providing the business-critical information you need straightaway. 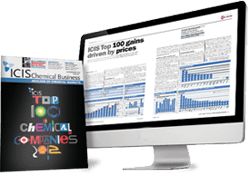 If you want to keep updated on the factors driving price movements in the global chemical markets, ICIS Chemical Business provides a summary of the information you need to support your business decisions. Every week, our global team of experts digests and summarises the key issues and their potential impact on the market – all in one magazine. An expert view of supply and demand comprising four fully-reconciled databases, giving you access to extensive data for more than 100 markets. Information is included on global and regional trade flows, production, capacity and sources of demand in the short-, medium- and long-term. Data can be downloaded, customised and queried to support your planning requirements and your strategic decisions. ICIS provides specialist training courses across the global petrochemicals, base oils and fertilizers industries. Our training team of industry experts can help you increase your knowledge of the industry and gain the insight and know-how needed to operate and trade effectively. ICIS produces a series of highly informative and timely conferences. Extensive research is carried out to ensure that each programme delivers the information you need and addresses current industry issues. We source speakers who have the appropriate expertise and experience to deliver excellent quality papers. Working closely with you to understand your strategies, challenges and ambitions, the ICIS consulting team deliver tailored advice and solutions to suit your unique requirements. With many years’ experience of guiding business leadership teams, we show you how market conditions can make a positive or negative impact on your long-term plans. ICIS expert consultants can provide your organisation with the insight, intelligence and data needed to build and grow your business in China. We can help you to gain a clear view on the short and long-term supply and demand picture in the chemicals, energy, iron and steel, non-ferrous metals and paper and pulp markets in China. ICIS price assessments are based on information gathered from a wide cross-section of the market, comprising consumers, producers, traders and distributors from more than 250 reporters world-wide. Confirmed deals, verified by both buyer and seller, provide the foundation of our price assessments. Our in-depth market knowledge drives our specialist focus, as we recognise the importance of individual market dynamics and not a one-size-fits-all approach. Over 25 years of reporting on key chemicals markets, including Polyols, has brought global recognition of our methodology as being unbiased, authoritative and rigorous in preserving our editorial integrity. Our global network of reporters in Houston, London, Singapore, Shanghai, Guangzhou, Mumbai, Perth and Moscow ensures unrivalled coverage of established and emerging markets. Polyols are a primary polyurethanes component. A polyol and an isocyanate react to form polyurethane. Polyols are one of the components used to make polyurethanes, the other being an isocyanate. There are two main types of polyols: polyether polyols and polyester polyols. Polyether polyols are the most widely used with the main applications being rigid and flexible polyurethane foams. Rigid foams are used mainly in insulation, refrigeration, packaging and construction while flexible foams have applications such as upholstery, mattresses and seats. Polyols can also be used in elastomers, adhesives, coatings and fibres. Polyester polyols compete with polyether polyols but may be preferred in some rigid foam applications because of their low cost and improved flame retardant properties. They can also provide improved wear resistance, heat aging and chemical resistance in elastomers, coatings, sealants and adhesives.